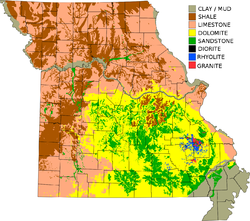 Missouri map of Köppen climate classification. The boundary between the northern plains and the Ozark region follows the Missouri river from its mouth at St. Louis to Columbia. This also corresponds to the southernmost extent of glaciation during the Pre-Illinoian Stage which destroyed the remnant plateau to the north but left the ancient landforms to the south unaltered. The Ozark boundary runs southwestward from there towards Joplin at the southeast corner of Kansas. The boundary between the Ozark and lowland regions runs southwest from Cape Girardeau on the Mississippi River to the Arkansas border just southwest of Poplar Bluff. Missouri borders eight other US States, more than any other state except Tennessee, which also borders eight states. It is more hilly and broken in its western half than in its eastern half. The elevation in the extreme northwestern Missouri is about 1,200 ft (370 m). and in the extreme northeastern portion about 500 ft (150 m)., while the rim of the region to the southeast, along the border of the Ozark region, has an elevation of about 900 ft (270 m). The valleys for the larger streams are about 250 to 300 ft (91 m) deep and sometimes 8 to 20 miles (32 km) wide with the country bordering them being the most broken of the region. The Ozark region is essentially a low dome, with local faulting and minor undulations, dominated by a ridge or, more exactly, a relatively even belt of highland that runs from near the Mississippi river about Ste. Genevieve to McDonald County on the Arkansas border. High rocky bluffs rise precipitously on the Mississippi, sometimes to a height of 150 ft (46 m) or so above the water, from the mouth of the Meramec River to Ste. Genevieve. These mark where that river cuts the Ozark ridge. Across the Mississippi River, this ridge is continued by the Shawnee Hills in Illinois. The elevations of the crests in Missouri vary from 1,100 to 1,700 ft (520 m). This second physiographic region comprises somewhat less than two-thirds of the area of the state. The Burlington escarpment of Mississippian rocks, which in places is as much as 250 to 300 ft (91 m) in height, runs along the western edge of the Ordovician formations and divides the region into an eastern and a western area, known respectively to physiographers as the Salem Plateau and the Springfield Plateau. Headward erosion by the south flowing tributaries to the White River in northern Arkansas has created a southern escarpment to both the Springfield and Salem plateaus that runs from McDonald through Barry, Stone, Christian, Douglas, and Howell counties. To the south of this escarpment lies some of the more rugged and highly dissected parts of the Missouri Ozarks. The famed Shepherd of the Hills region near Branson lies within this rugged area. To the east of the West Plains plain lies the dissected valleys of the Eleven Point River and the Current River. The two highest points in the state are Taum Sauk Mountain at 1,772 ft (540 m) in the St. Francois Mountains in Iron County and Lead Hill just east of the community of Cedar Gap at 1,744 ft (532 m) in the southwestern corner of Wright County. Few localities have an elevation exceeding 1,400 ft (430 m). Rather broad, smooth valleys, well degraded hills with rounded summits, and despite the escarpments generally smooth contours and sky-lines, characterize the bulk of the Ozark region. The third region, the lowlands of the south-east and part of the Mississippi Alluvial Plain, has an area of some 3,000-square-mile (7,800 km2). It is an undulating country, for the most part well drained, but swampy in its lowest portions. The Mississippi is skirted with lagoons, lakes and morasses from Ste. Genevieve to the Arkansas border, and in places is confined by levees. These lowlands are the northernmost extent of the Mississippi embayment. The area is within the New Madrid Seismic Zone and includes the epicenter location of the 1811–12 New Madrid earthquakes at New Madrid, Missouri. The Ozarks region has a well-developed karst topography with numerous areas of sinkholes, stream capture, and cavern development. Marvel Cave is located a short distance southeast of the center of Stone county. The entrance originally was through a large sink-hole at the top of Roark Mountain, though now an easier entrance has been made. Marvel Cave has a large hall-like room about 350 ft (110 m) long and about 125 ft (38 m) wide with bluish-grey limestone walls, and a vaulted roof, rising from 100 to 295 ft (90 m). Due to its acoustic properties the room has been named the Auditorium. At one end is a large stalagmite formation about 65 ft (20 m) in height and about 200 ft (61 m) in girth, called the White Throne. Exploration of Jacobs Cavern, near Pineville, McDonald county, revealed human and animal skeletons along with crude implements. Crystal Cave, near Joplin, Jasper county, has its entire surface lined with calcite crystals and scalenohedron formations, from 1 to 2 ft (0.61 m) in length. Other caves include Friede's Cave, about six miles (10 km) northeast of Rolla, Phelps County and Mark Twain Cave (in Marion County, about one mile (1.6 km) south of Hannibal), which has a deep pool containing many eyeless fish. Guccione, M., 1983, Quaternary sediments and their weathering history in north central Missouri. Boreas. vol. 12, pp. 217–226.